Last week we concluded our month-long adventure in Costa Rica and headed onward to Mexico City. But before we left Costa Rica, we paid a visit to Manuel Antonio National Park. It was the first time we’d ever gone swimming in an ocean at a national park. The sun was shining, the water was warm, and there were tons of monkeys jumping from tree to tree along the shore. We spent three days in the Manuel Atonio/Quepos area (see the place we stayed on our list of preferred accommodations), and we spent time at a different beach each day: the first at a private beach, the second in the park, and the third at Playa Espadilla, just outside the park entrance. 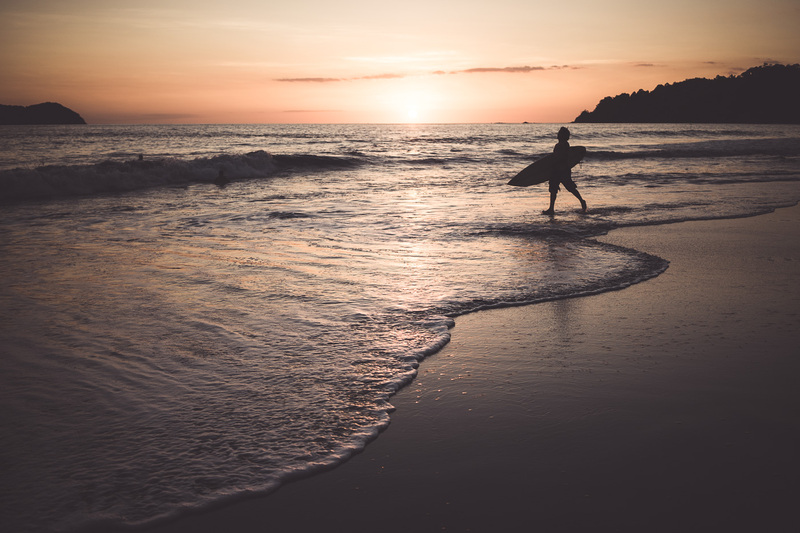 This photo of a surfer heading out into the waves during the last light of the day was taken on that third beach day, at Playa Espadilla, with the Sony a7 II and 35mm f/2.8 lens. (Continue to view full photo). This post was handcrafted for you during our travels in Mexico.